I received this readers question in my inbox this week. I thought to share it with you, as I get many questions on the same subject. Not too long ago my girlfriend and I acquired two giant prickly stick insects, and using your information on the web we’ve been watching them grow with keen interest and joy. They have finished their final molt and we’ve been keeping an eye out for eggs, however since their last molt they have not eaten (save once, and very little at that) regardless of the leaves. My question being is this a sign of something wrong or do they recoup for a bit longer before eating after the final molt (usually they get hungry post molt after about a day or two, it is now approaching four days.)? We haven’t seen any eggs dropped, but they are still little poop machines, not nearly as much before but only slightly less in that department, so I’m unsure what is going on as I can tell from the leaves they are not eating. I’m happy to tell that there is no need to worry about the health of these two stick insects. 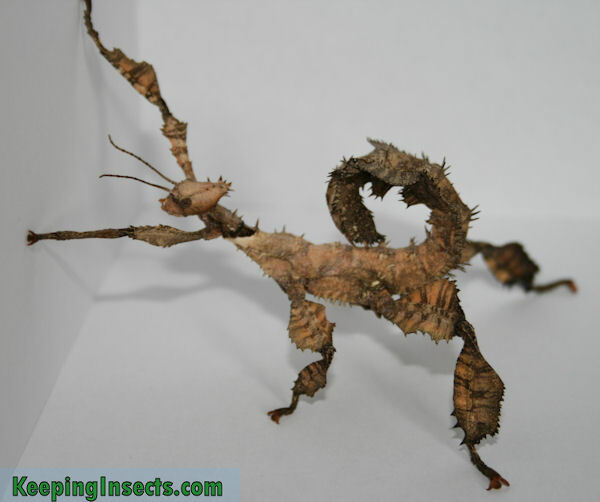 It is normal for stick insects to stop eating just before and just after shedding their skin. Sometimes that takes just one day, sometimes a bit more. It should not take more than around 5 days. A stick insect can live without food for some time, especially if they are older and bigger and thus have more reserves. As the stick insects of Bryon still poop, they still have some food to digest so it’s even less crucial for them to eat. It’s important to keep the food available and keep the air humidity at high enough level. Spraying some extra water droplets more often will allow them to drink more, as when fasting they are not taking in any moisture from their food. The eggs will not be produced until around 4 weeks after the final molt. With the giant prickly stick insect the eggs are very easily distinguished from the poop. The eggs cannot be missed. It’s just waiting now for them to be produced! If you like insects and especially praying mantises, keeping a mantis as a pet can be a lot of fun. It will give you time to study the mantis better, watch it grow and develop, make amazing macro pictures of it and observe its hunting behavior. But which mantis species is suitable for someone who never kept insects as pets? What is the best mantis species for beginners? Not every mantis species has the same needs. Some species are easy to keep because they can live in a wide variety of environments: its not easily too cold or too hot and they are not as sensitive to air humidity and food quality. Other species are very picky and won’t thrive if you are not on top of their precise requirements. If you are just starting out as a beginning insect keeper, it is hard to be on top of all the details. You have to check so many things, it can be overwhelming. After some research it turns out to be a Case Moth larva. And these bugs turn out to be pretty interesting! They live inside a case made of sand, plant material and debris that they gather themselves. They use silk and the materials to make a bag where they hide in. The bag or case protects them and helps them to hide from predators. Because case moth larvae have to make use of the materials they find to make their casing, they can look very differently. The one on the picture has gathered quite a few small sticks to make a casing with horizontal lines. Very fashionable! Especially with the sandy collar area. Other common names for case moths are bagworms. 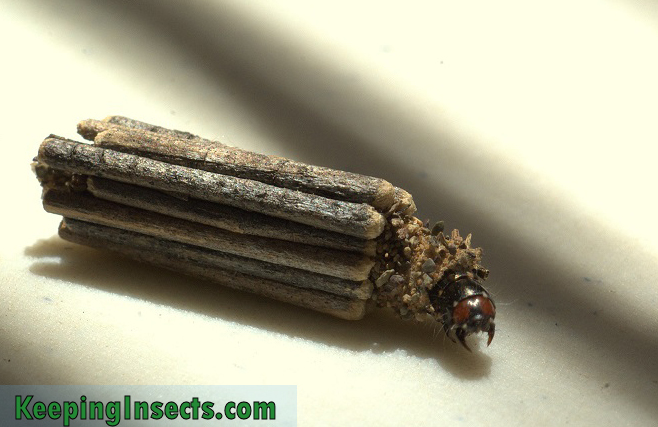 They belong to the family Psychidae. There are around 1400 species of bagworms and they occur all over the world. Only the larvae wear the distinctive bag, after pupation inside the bag a small moth emerges. The colors, size and host plant differs greatly between the species. The picture is made with: Pentax K200D, macro lens Cosina 100mm, F13, 1/25sec., ISO500 by Martina Stoecker. Thank you for this site it’s so informative. I myself am not much of an insect fan, but we had this mantis in our garden for several months this summer. It’s been fun observing him, then we had a sudden temperature drop this week and decided to bring him in so he wouldn’t die (it snowed). We have a nice enclosure for him, he’s been eating well and I do mist the plants in the enclosure for him to drink from. I’m just curious about the color of his eyes. When he was outside they were green, now they seem to have gotten darker. I work so I only see him in the early mornings and late evenings when I get home. In the garden we only observed him in sunlight as he would hide out of sight at sunset. Is this color change normal due to lower light, or is this a sign that something is wrong? It’s a close observation and I’m glad to say it’s completely normal. The eyes of a mantis will differ in color depending on the light conditions. Pigments in the eyes of a mantis will gather when there is low light or darkness. You can see this around half an hour after the mantis is placed in the dark. In the light the pigments will disappear again leaving the eye light-colored. In different mantis species the color of the eye changes. In the Orchid Mantis Hymenopus coronatus the eyes can be white or light-pink in bright light conditions and deep purple in darkness. It’s a stunning difference! Mantises with green eyes will change the color between light green and dark green, almost black. Mantises with brown eyes like the Dead Leaf Mantis Deroplatys desiccata will develop completely black eyes in darkness. The eye color probably changes to facilitate better vision for the mantis. It is unclear how the pigmentation helps the mantis in its ability to see better. There is one condition, an illness, in which mantises get dark eyes. This is not caused by pigmentation and it does not depend on light conditions. It’s a permanent black or dark spot in the middle of the eye and it does not move position when you look at it from different angles. It is damage to the surface of the eye caused by scratching the eyes of the mantis against the glass or plastic of its container. Sometimes a mantis can get obsessive trying to approach or catch a prey that is on the other side of the glass container. While trying to approach the prey the mantis brushes its eyes back and forth against the glass, damaging the eyes. When the wound gets infected it turns black. This problem is pretty severe because the eyes will not recover and vision is lost in the area where the wound is. If you see your mantis brushing it’s head and eyes against the container, make sure to remove the object it is after or place the mantis in a net cage. This will prevent any other damage to your beautiful pet mantis.